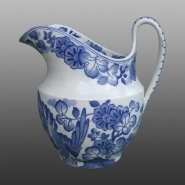 Also shown here is a small earthenware ewer printed in blue in the Old Peacock pattern. An earthenware foot bath printed n blue in the Old Peacock pattern. This scarce pattern dates from 1815 to 1825. Robert Copeland suggested that the design might have been derived from a Japanese porcelain plate made at the Arita kilns for the Dutch East India Company and that the birds might be ho-ho birds, or phoenixes. Leonard Whiter had called the pattern Old Peacock, although this name does not appear in the print record book.